Choose 3500K for our Super Sale Price! Office Panels can only be shipped in multiples of 2! Features pre-mounted drivers for contractor friendly installation. Mounting holes provided for seismic wire application. Advanced optical design generates even light distribution with optimal uniformity, no visable diodes, hot spots or shadows providing glare-free illumination. 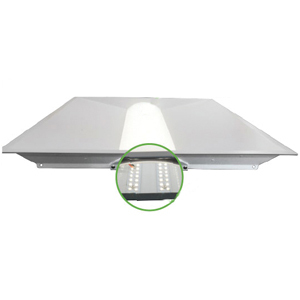 The Architectural LED Troffer provides an economical, easy-to-install upgrade from linear fluorescent lighting to a long-lasting and energy-efficient LED solution. The contemporary center lens design delivers a soft natural glow with even illumination and minimized glare making it an attractive general-purpose ambient lighting solution. The direct/indirect recessed troffer also features a pre-mounted driver with a high efficiency, maintenance-free, LED chamber and is available in 2x2 or 2x4 configurations. 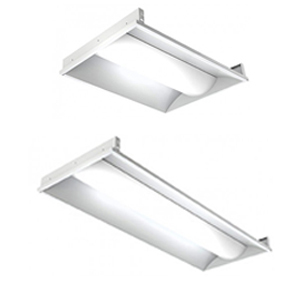 Whether it’s a school, hospital, airport, office or convenience store, Superior Lighting's low profile recessed led troffers bring a stylish and economical lighting solution to all commercial, educational, medical, and retail applications. 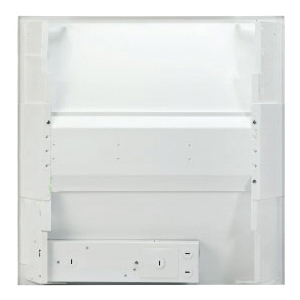 Available in 2'x2' 40W and 2'x4' 50W for recessed installation. Lumen output from 4280 lm with efficacy of 107lm/W. White powder coated steel housing improves the efficacy of the fixtures. Built-in earthquake clips for safety. UL listed and DLC qualified. Office, school, hospital and any commercial applications.